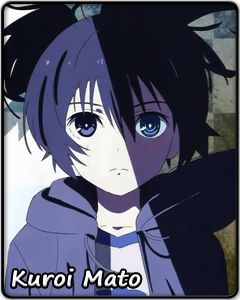 Mato is an ordinary girl with perfectly ordinary problems. She wakes up early from excitement on her first day in junior high, only to nearly end up being late for the opening ceremony after she forgets about the time. Her favorite subject is PE, and she 'still hopes to discover her talent' for anything else. Mato is always energetic and optimistic, and sometimes more than a little ditzy. For Mato, junior high is a time to slowly grow as a person, find her strong points and gain the confidence she needs to succeed in life. But all that would be difficult without the support of a friendly shoulder. Finding the courage to speak to a girl from her new class, Mato establishes a bond that will bring her endless happy memories. But for a girl who is just discovering herself and the world around her, there will always be times when she does not know what to do and feelings she does not know how to protect. When crisis looms over her loved ones, Mato's new-found strength will be put to the test. Will what she has learned be enough to overcome fear, betrayal and the cage of loneliness? Mato does not think about such questions as she races ahead, going as fast as possible to save her friend.